So here's the first: Twill gamp for 8 shafts, using simple threadings. Then there was a sample with two threadings (straight twill and point twill) and treadled seven different ways. It's amazing how these two simple threadings change so much! There is a shadow weave, which I love! This one is woven using wool. The drape and sheen of the bamboo is wonderful. I will add more of this to my stash in time! It's neat how there is not a trace of one coloured side showing on the other except for the row near the hemstitching. Would make a great reversible rug or lap throw. So there is one more sample to come and that's a 4 shaft twill gamp that's all set on my loom. I'm short the 8 dent reed right now (2 ends per dent for 16 epi) I do have a 15 dent reed and I'm thinking " close enough' for me! I started to sley this reed today until my back told me no more! 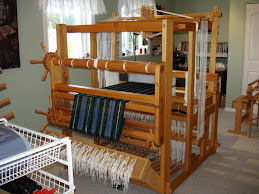 This was my table loom all set to go to the workshop. I'll record how this twill gamp goes as I weave it off and wet finish it. It's 4/8 cotton which is nice and soft, although a bit large for my tastes. But double weave using 4/8 would great placemats. I have a small stash of 4/8 and now I know how to use this up. Back report: I seem to be stuck. I'm not any worse, but I don't seem to be improving either! I think physiotherapy is the key but there's no getting in any sooner than the 23rd. It started to rain this afternoon, so at least I have a reason for staying inside now. I did get around the flower beds yesterday and got some nice shots of flowers opening. Will share some next post. Finally: sorry about the weird grouping of pictures and text. I have no idea why it went this way as its not what I asked Blogger to do! Perhaps I can re-edit it to to a better layout next time.